Astronomers have seen an asteroid change the rate at which it spins for the first time, and shown that it is due to a theoretical effect predicted but never before seen. The international team of scientists from Europe and the United States used a range of telescopes (including the LT) to find that the asteroid is rotating faster by 1 millisecond every year, and is caused by heating of the asteroid?s surface by the Sun. Eventually it may spin faster than any known asteroid in the solar system. The Yarkovsky-O?Keefe-Radzievskii-Paddack (YORP) effect is believed to alter the way small bodies in the solar system rotate. YORP is a torque due to sunlight hitting the surfaces of asteroids and meteoroids and warming their surfaces, leading to a gentle recoil effect as the heat is emitted. By analogy, if one were to shine light on a propeller over a long enough period, it would start spinning. Although this is an almost immeasurably weak force, astronomers believe it may be responsible for spinning some asteroids up so fast that they break apart, perhaps leading to the formation of binary asteroids. Others may be slowed down so that they take many days to rotate once. The YORP effect also plays an important role in changing the orbits of asteroids between Mars and Jupiter, including their delivery to planet-crossing orbits. Despite its importance, the effect has never been seen acting on a solar system body, until now. Using extensive optical and radar imaging from powerful Earth-based observatories, astronomers have directly observed the YORP in action on a small near-Earth asteroid, known as (54509) 2000 PH5. This work is reported in two companion papers, in the March edition of Science Express [1, 2], by Stephen Lowry et al. (Queens University Belfast, UK) and Patrick Taylor et al. (Cornell University, Ithaca, NY, USA). Asteroid 2000 PH5 imaged at optical wavelengths using ESO’s 3.5m New Technology Telescope in Chile on August 27, 2003. The asteroid can be seen moving relative to the background stars (source: S. Lowry). Shortly after its discovery in 2000, it was realized that this asteroid would be the ideal candidate for such a YORP detection. At just 114m in diameter, it is relatively small and so more susceptible to the effect. Also, it rotates very fast, with one day on the asteroid lasting just over 12 Earth minutes, implying that the YORP effect may have been acting on it for some time. With this in mind, the team of radar and optical astronomers undertook a long term monitoring campaign of the asteroid with the aim of detecting any tiny changes in the spin-rate. 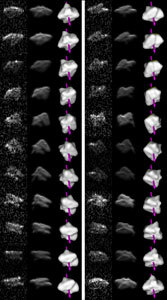 Radar images obtained at the Arecibo facility in Puerto Rico on July 28 2004, covering one full rotation of asteroid 2000 PH5 (columns 1 and 4). Corresponding shape-model fits to the images are shown in columns 2 and 5. Columns 3 and 6 are detailed 3-D renderings of the shape model itself (from Taylor et al. ). Over a 4 year time span, Stephen Lowry, Alan Fitzsimmons and colleagues took images of the asteroid at a range of telescope sites including the 8.2m Very Large Telescope array and the 3.5m New Technology Telescope of the European Southern Observatory in Chile, the 3.5m telescope at Calar Alto, Spain, along with a suite of other telescopes from the Czech Republic, the Canary Islands, Hawaii, Spain and Chile. With these facilities the astronomers measured the slight brightness variations as the asteroid rotated. Over the same time period, the radar team led by Patrick Taylor and Jean-Luc Margot of Cornell University employed the unique capabilities of the Arecibo Observatory in Puerto Rico and the Goldstone radar facility in California to observe the asteroid by "bouncing" a radar pulse off the asteroid and analyzing its echo. 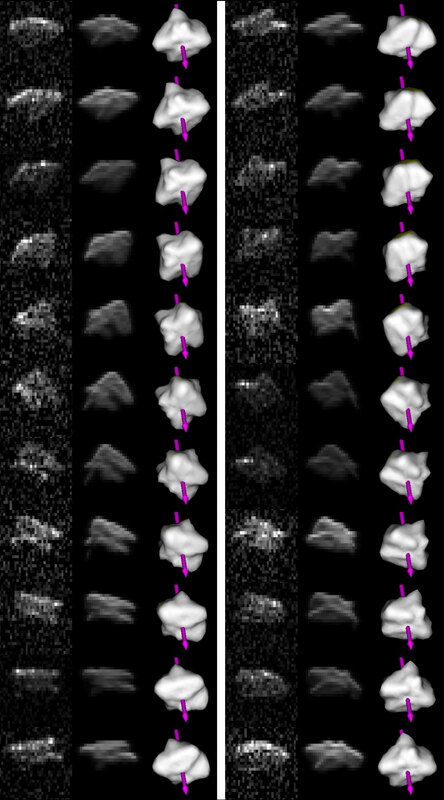 With this technique astronomers can reconstruct a 3D model of the asteroid?s shape, with the necessary detail to allow a theoretical YORP value to be derived and compared with the actual observed spin-rate change seen at optical wavelengths. With careful analysis of the optical data, the asteroid?s spin rate was seen to steadily increase with time, at a rate that can be explained by YORP theory. Critically, the effect was observed year after year. Furthermore, this number was elegantly supported via analysis of the combined radar and optical data, as it was required that the asteroid be increasing its spin-rate at exactly this rate in order for a satisfactory 3D shape model to be determined. The observed spin-rate was seen to change from year to year (black dots). The solid curve is the expected theoretical YORP strength derived from the 3-D shape model (from Lowry et al. ). To predict what will happen to the asteroid in the future, Lowry et al. performed detailed dynamical computer simulations using the measured strength of the YORP effect and the detailed shape model. They found that its orbit about the Sun could remain stable for up to 35 million years in the future, allowing the spin-rate to be reduced to just 20 seconds, faster than any asteroid spin-rate ever seen by astronomers. This exceptionally fast spin-rate could force the asteroid to reshape itself or even split apart, leading to the birth of a new binary system. Stephen C. Lowry, Alan Fitzsimmons, Petr Pravec, David Vokrouhlicky, Hermann Boehnhardt, Patrick A. Taylor, Jean-Luc Margot, Adrian Galad, Mike Irwin, Jonathan Irwin, and Peter Kusnirak (2007). Direct Detection of the Asteroidal YORP Effect, Published online in Science Express (www.sciencemag.org). Patrick A. Taylor, Jean-Luc Margot, David Vokrouhlicky, Daniel J. Scheeres, Petr Pravec, Stephen C. Lowry, Alan Fitzsimmons, Michael C. Nolan, Steven J. Ostro, Lance A. M. Benner, Jon D. Giorgini, Christopher Magri (2007). Spin Rate of Asteroid (54509) 2000 PH5 Increasing due to the YORP Effect, Published online in Science Express (www.sciencemag.org).